The GAO800 Optical Power Meter, a new generation high-performance optical network test meter, has adopted the latest laser exploration and processing technology. The GAO800 meter is suitable for optical network maintenance, as well as equipment research and development. It can test optical power within a 800~1600 nm wavelength range, with display units in μW, dB, and dBm. Four wavelength calibration points are available: 850, 980, 1310, and 1550 nm. The meter performs both linear and non-linear tests, and can display both direct and relative power. It provides functions for storage and page up/down. 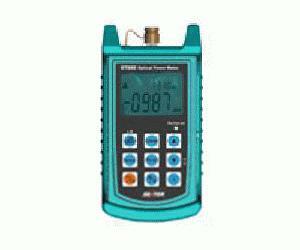 The instrument, with its large LCD screen, is small, light, and easy to carry. Applications include the testing of LANs, wide-area networks, metropolitan networks, CATV, or long-distance fiber networks. It can be used to distinguish between fibers, test fiber loss, check fiber continuity, and evaluate transmission quality.